We will fight, learn and evolve to achieve a better India. Ever since the Assembly election results of 2017, many people have started to write the Aam Aadmi Party's obituary. I find it very amusing that the media, a section of intellectuals and our rival parties find it so fascinating that the AAP is not growing like a Google or a Microsoft. These people fail to realise that the growth trajectory of a political party is different from that of a corporate firm. To understand what the AAP achieved in four-and-a-half years since its inception in November 2012, one must understand what other two major political parties of our times, the Bharatiya Janata Party (BJP) and the Congress achieved in the first five years of their existence. Similar to the BJP and the Congress, the AAP also emerged from a movement. Let’s delve a bit into the nature of the movements the three emerged from. The AAP is faring much better than its two senior counterparts — the Congress and the BJP. The Congress was founded in 1885, and from then till 1935, all it fought for was “right to choose its own representatives”. Until 1935, representatives were chosen for the British House of Commons — and the first one being the Grand Old Man of India, Dadabhai Naoroji, who was the first Asian to be a British MP. After Mahatma Gandhi came to India and took charge of the Congress, things went to the next level. The non-cooperation movement in 1930 was a major turning point and for the first time direct elections were introduced in India through the Government of India Act, 1935. Thus, it took almost 50 years for the movement to achieve its first substantial success. The Rashtriya Swayamsewak Sangh (RSS), the BJP's predecessor, started as a non-governmental organisation in 1925. The initial impetus was to provide character training through Hindu discipline and to unite the Hindu community to form a Hindu Rashtra. However, the RSS stayed away from the Indian independence movement and did not engage in any form of resistance against the colonial British government. Post-independence, the RSS forayed into mainstream politics in 1951 in the form of Bharatiya Jana Sangh (BJS) also known as the Jan Sangh.Thus, it took at least 27 years before the RSS movement became political and got into electoral politics. 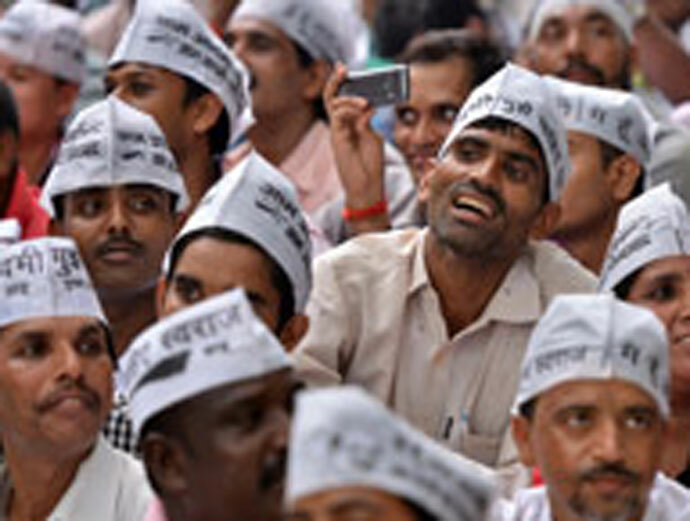 The Aam Aadmi Party emerged from the India Against Corruption (IAC) movement. IAC, which started in November 2010, brought together prominent people from the civil society and others from various walks of life. The movement was against corruption in the Congress-led UPA government, and in August 2011, hit its peak with millions thronging the Ramlila Ground in Delhi, where Anna Hazare sat on a fast against the Union government for 13 days. By August 2012, it was clear that the movement will take a political route and by November 2012, two years since the formation of IAC, the AAP was born. In those terms it is very evident that the AAP was the one which evolved from a movement to political entity in the shortest span of time. In my own personal and humble opinion, this is due to the fact that over the years the fast pace of life and real time communication modes helped in this fast evolution of IAC to AAP. Talking about electoral politics, the Congress fought elections for the first time after the introduction of direct elections through Government of India Act, 1935. It fought the Indian provincial elections in 1937, and gained power for the first time winning 707 out of the total 1585 seats and getting 44.6 per cent votes. The Jan Sangh fought the first Lok Sabha elections and won three seats with 3.06 per cent votes.The BJS's strongest constituencies were in Rajasthan, Gujarat, Maharashtra, Madhya Pradesh, Bihar and Uttar Pradesh even though it never formed government in any of these states. The BJS with several other left, centre and right parties opposed the rule of the Indian National Congress and merged to form the Janata Party. After the Janata Party split in 1980, it was re-formed as the Bharatiya Janata Party (BJP) in 1980. The BJP fought the eighth Lok Sabha elections in 1984 and won two seats with 7.74 per cent votes. It formed its first state governments in 1990 by winning Himachal Pradesh, Madhya Pradesh and Rajasthan Assembly elections. The AAP fought its first state elections in 2013, and won 28 seats out of 70 with 29.49 per cent votes. In 2014 Lok Sabha polls, it won four seats with 2 per cent votes. However, the AAP resigned from the Delhi government in February 2014, and fought the Assembly elections again in February 2015. It got an emphatic majority, winning 67 of the 70 seats in Delhi and 54.3 per cent of the vote share. In 2017, the AAP fought the state elections in Punjab and Goa and won 20 out of 117 seats in Punjab becoming the principal opposition party with 23.7 per cent votes while failing to get any seats in Goa (with 6.3 per cent of vote share). If one does a simple comparison of where the Congress, the BJP and the AAP stood five years from their inception, it would be clear that the AAP is faring much better than its two senior counterparts. However, it must be understood that each of these parties stood up and fought for what their organisation believed in, in the most hostile of environments during their initial years. When I see my fellow volunteers getting disheartened all I want to tell them is that no movement anywhere in the world made a difference without having its share of difficulties. So much so that when Mahatma Gandhi suspended the civil disobedience movement, following the deaths of policemen at Chauri Chaura in 1923, a number of leaders like Chittaranjan Das, Annie Besant and Motilal Nehru resigned in protest to set up the Swaraj Party. The Congress was split, but still that was the very Congress that led our forefathers to freedom in 1947. The Congress today may not be the same party that existed in the pre-independence days, the BJP too is no longer what it used to be when led by Atal Bihari Vajpayee. The AAP is still too young and we will fight, learn and evolve to achieve a better India, where basic rights like clean drinking water, education and health of every individual are taken care of. That's all. The author is IT head with Aam Aadmi Party.